The welded boiler was sitting waiting for work to recommence when I was there early this year. Must mean 1089 is back together and the bomber is finished too. 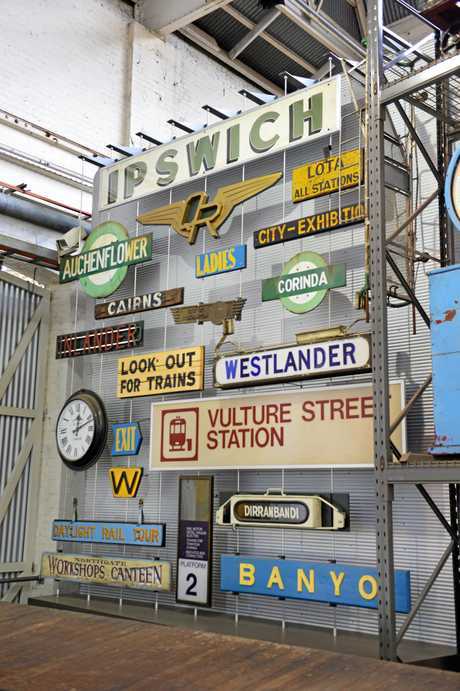 Some 11,000 pieces — including locomotives that have working lights or can billow smoke — have been donated to the Ipswich museum. That represents about half the collection from the estate of late Wollongong businessman Marsden Williams. A HISTORIC locomotive that was used to transport essential supplies during the period of trench warfare on the western front has been been fully restored and is now on display at The Workshops Rail Museum. At a media only event, The Workshops' new curators were chuffed to show off their latest display, the Hunslet No. 327, which will be a permanent display at the popular tourist attraction. Built in 1916 by the Hunslet Locomotive Works of Leeds, England, the engine was one of 665 steam locomotives ordered by the British War Office during the World War I and dispatched to France to move supplies to the front lines. "This locomotives job was to transport food, ammunition and all equipment needed to service the front during the war,” explained collection manager Rob Sheils at the unveiling. "It was used between standard gauge trains and the front. Following the end of the war the locomotive was rebuilt by Hunslet Engine Co and in June 1920 it was one of 15 War Office Hunslet locomotives purchased by the Queensland Government and shipped to Mackay to begin work as a cane train at the North Eaton Sugar Mill. The locomotive was retired in 1964 and moved to Etons Langford Park where it was put on static display for the community. Due to deterioration, it was removed in 2005 and generously donated by the Mackay Sugar Co-Operative Association to The Workshops Rail Museum in Ipswich. For more than five years, a group of dedicated train enthusiasts worked tirelessly to restore the Hunslet No. 327 back to its original First World War configuration. To start, the engine was carefully disassembled, rusted out panels were replaced and other damage repaired. As much of the original fabric as possible was preserved. Each step of the process was carefully recorded and photographs were taken. While the Hunslet is the new jewel in The Workshops Rail Museum crown, curators are keen to remind the Ipswich community they are always working to install new exhibits and attractions which will appeal to people of all ages. Over the years, The Workshops have had numerous items donated to them, which are currently in storage. But curators hope to bring them out onto the floor and have them on display in the coming months. In the meantime, there are still plenty of incredible things to see and do. The premise has a very long and impressive history, which is evident in the old buildings which are still proudly standing today. This was the site where trains were built, maintained and new technology invented for the fast-pace rail industry in the 20th century. In its time, more than 200 steam locomotives were built right here in Ipswich at The Workshops. It is also where the very first train to run in Queensland steamed. It ran from here to Bigges Camp, now Grandchester, over 145 years ago. The old time keepers office, which is now the ticket office for The Workshops, is one of the oldest buildings on site. It was built around the early 1900s. It has recently undergone renovations, including a fresh coat of paint, to be an attractive and historical monument to welcome guests. In the coming weeks, a number of artefacts will be moved into the building, creating an exciting exhibit upon entry. One of the monuments which you will see straight away when you walk in is the honour stone. This is where the names of those who worked at the Workshops Rail Museum and served during the war are forever engraved. There are more than 300 names. During its peak in WWII, more than 3,000 people worked on site, making it the state's largest employer at that time. Many of its employees went to fight overseas and sadly did not return home. One of the most interesting names on the honour stone is a gentleman named William Gunn. He worked hard at The Workshops and wrote countless letters to the Queensland Times newspaper. His last letter to be published in the Queensland Times coincided with the news of his death overseas. Now, The Workshops is again an icon for the region. 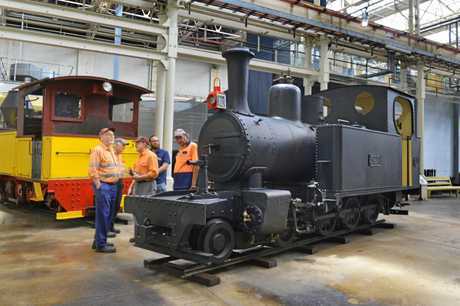 The rebirth of the site in 2002 as a world class rail museum, coupled with the oldest continually operating railway workshops in Australia, makes for a visitor experience second to none. It currently has five large locomotives and five passenger coaches to admire. Standing next to these trains you will truly understand their immense size and power.. There is also a wide array of artefacts and personal belongings from those who helped shape the rail industry when they worked there. But there is much more to the museum than trains. They also feature a wide array of exhibits and community events, such as their new twilight markets. 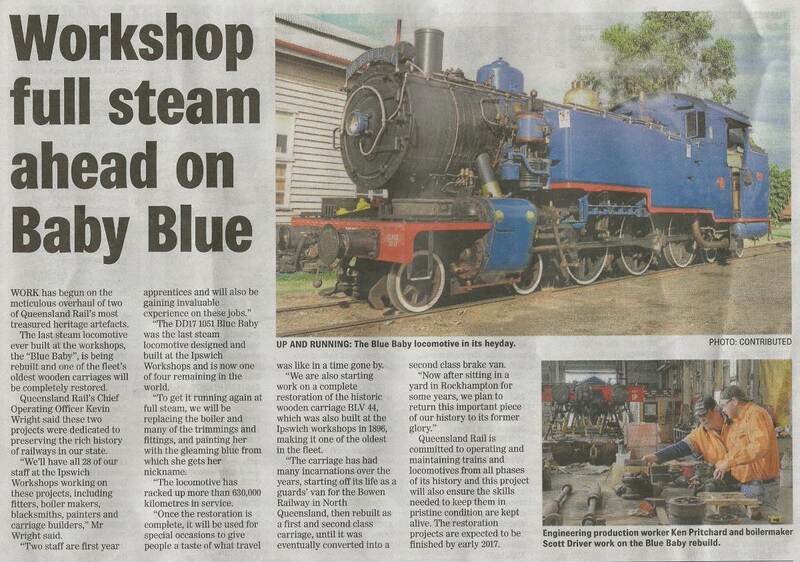 If you are looking for a fun day out, be sure to pop the Ipswich Workshops Rail Museum on your list.